Click any of the images below to download free patterns. What a great way to showcase the Redwork panel, Christmas Morning. 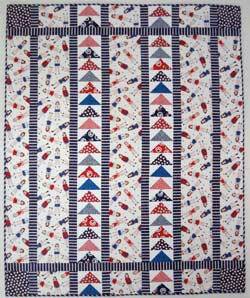 Turn the nine panels into a lovely quilt by framing them twice and adding sashing and a generous border. 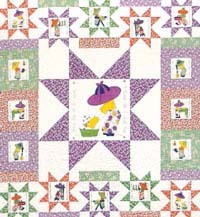 Bavarian Rose - Combine simple piecing with machine applique to create a fabulous quilt. The rose applique is taken from one of the vintage prints in the line. It's simple but elegant shape allows for easy construction. 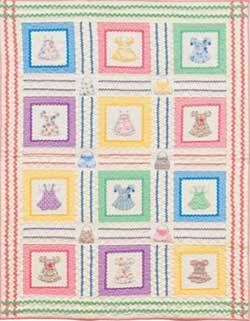 This darling quilt uses the Dolly Dresses and Purse Panel. Just add sashing and rick rack for a wonderful effect. 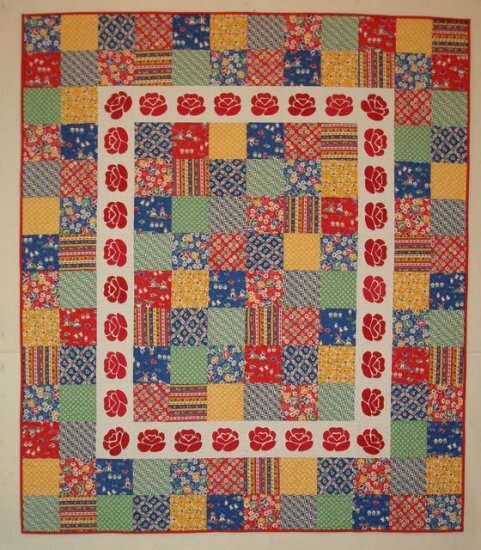 What little girl wouldn't love this quilt? 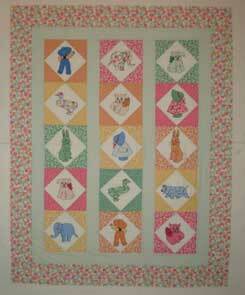 The quilt has paper dolls on it. Cut out the dresses from the fabric, fuse them to batting, and you can play dress-up right on the quilt. 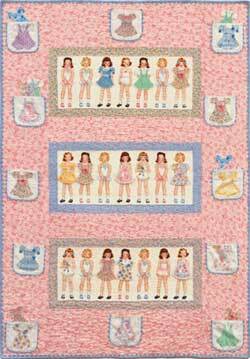 Pockets in the borders, trimmed with rick rack, are the perfect place for storing the dresses! Bring sparkle to these charming Christmas Memories blocks by adding a star sashing. Here's a great way to finish your At Play blocks. 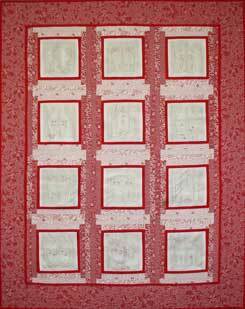 The toile fabrics are a perfect companion to the embroidered blocks and you can use the bonus pinwheel blocks as corner stones. This is also the perfect setting for the embroidered basket blocks. 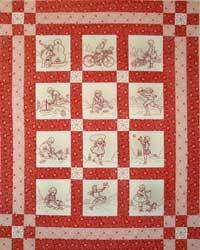 The opportunity panel in the Dear Dorothy line is cut into blocks which are framed, then set together in a strippy design in this quick quilt. The blocks really have the look of 1930's applique! 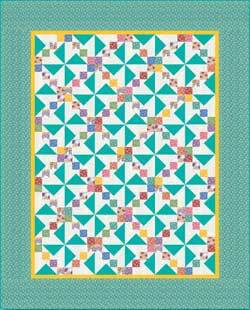 Use this pattern to set together some of your favorite blocks to reproduce it just as it looks here. The finished quilt is 52" x 66". 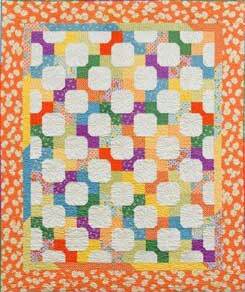 This quilt is made with Karen's adorable Sweet Pea line. The lollipops are fun to make, and the lollipop sticks can be made with fusible black bias. It's a huge time saver! 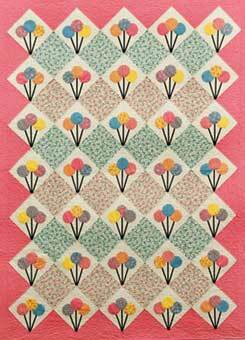 This pattern is inspired by Karen's Through My Window redwork fabric line. Here's a fantastic way to use the pre-printed panel of monthly window blocks. 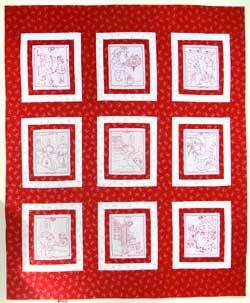 Make a 49" x 62" quilt or wall hanging from them using a simple but effective courthouse steps pattern. Bow Tie blocks can be so charming--and fun to make. 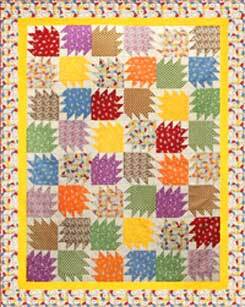 This quilt uses Karen's Daisy-A-Day fabric line. Scraps left over from the blocks form the inner border and binding. Inspired by Karen's newest fabric line, Wash Tub Bears. 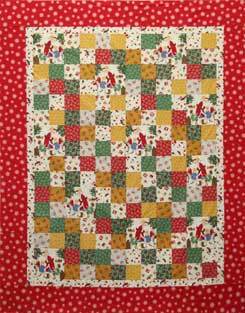 This Four Patch quilt is a perfect use for Karen's Santa Claus Lane fabrics! 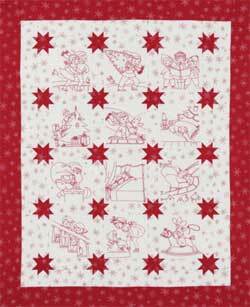 This pattern is another great project for Karen's Santa Claus Lane fabrics! 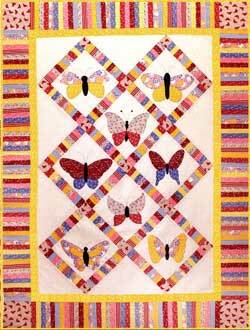 Shown using Karen's Wash Tub Butterflies fabrics. Inspired by Karen's first line of Wash Tub Prints! Also inspired by Karen's first line of Wash Tub Prints!